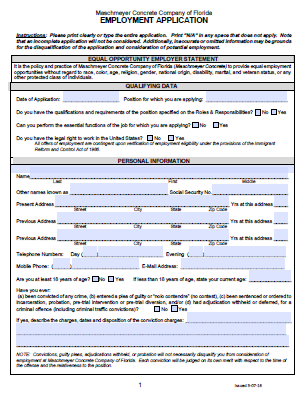 Applications for employment at Maschmeyer Concrete Company is provided in a fillable PDF format, which allows applicants to enter data directly into the form using their computer and Adobe Reader. Applicants are responsible for the completeness and accuracy of all information provided in any application. It is the policy and practice of Maschmeyer Concrete Company (Maschmeyer Concrete) to provide equal employment opportunities without regard to race, color, age, religion, gender, national origin, disability, marital, and veteran status, or any other protected class of individuals. Applicants should review the following instructions for successfully completing the fillable PDF forms on the Maschmeyer Concrete Company website. ​Avoid completing the application online within your web browser using a built-in PDF viewer, or by using MAC Preview (Macintosh OS). You must save the file to your computer BEFORE you begin. Click on the thumbnail above to open & download/save the application file. "From the time I joined the team at Maschmeyer Concrete ten years ago, I have been treated like family. This is more than just a place to work-it's a career! In my previous jobs, I never felt I would retire from there. At Maschmeyer, I do not see myself working anywhere else." Before completing the application, save the application form (PDF format) to a drive or location on your computer (e.g., Desktop). The Save button provided on the form will open a Save As dialog box, which will allow you to save the application to a desired location on your computer. If viewing the form in a built-in PDF viewer (e.g., Chrome, FireFox), right-click the PDF and select Save as or Save Page As. Make sure the Save as type is set to Adobe Acrobat Document (*.pdf). Alternatively, you may save the PDF form without opening the file in either Adobe Reader or in any built-in PDF viewer. Simply right-click on the hyperlink for the PDF form and then choose the Save link as... or Save target as... option. Note the file name and location of the saved file. 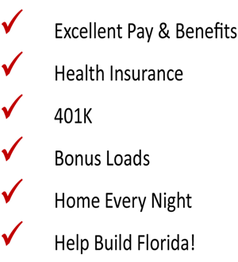 Once you have saved the application to your computer, you are ready to complete the form. Please be advised that the fillable PDF forms will not automatically save. It is strongly recommended that you periodically save data entered into a form by using the Save button on the form, or by clicking File > Save on the Adobe Reader menu bar. After you have completed the application, save a final version of the file to your computer. ​After you have completed the form and saved a final version of the file to your computer, you may then email the PDF file to Maschmeyer Concrete Company as an attachment via either a desktop email client (e.g., Microsoft Outlook) or Web email account (e.g., Gmail, Yahoo Mail). Insert the Your Name (e.g., John Smith Job Application) into the subject line. Click the Send option in your desktop email client. Locate the completed application form that you saved to your computer, and attach the PDF file to your email message. ​Thank You for your interest in Maschmeyer!